Kelly Jones has been a Recording Connection mentor for more than a decade. 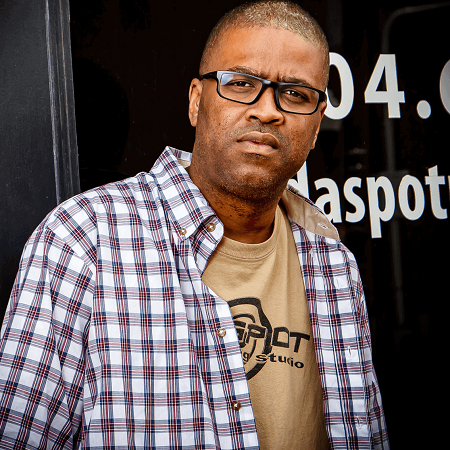 As co-founder of Da Spot Recording (DSR) in Richmond, VA, the audio engineer/producer and manager is known for instilling our students with a deft understanding of the craft and the art of making quality music, right alongside superior studio etiquette and soft skills such as client interaction, coaching, and collaboration. We recently caught up with Kelly to garner a few words of wisdom we can put to use and to learn more about the Recording Connection graduate he just hired–Trevion Belton! In a prior conversation with us, you mentioned “the relationship behind the glass” as being as important as technical prowess. Could you explain? “A lot of times nowadays the engineer and producer lines kind of blur. So what happens is that artist is coming into the studio, this is their artwork, this is their baby. They’re entrusting you to take care of their baby in the recording process…They’re saying, ‘Okay, my vision is this. I want this.’ And that’s really a producer’s job, to get what the artist’s vision is onto the tape or whatever. [But] as an engineer you can’t be cold and just pushing buttons, a monkey can do that. So you have to let them feel comfortable while they’re there, make sure they’re comfortable, make sure they’re able to translate to you what they want, and just kind of make sure that session flows at a good pace and a good rhythm for that particular artist. That’s probably more important than being technically sound, is dealing with different personalities. And the goal is to make sure that artist feels comfortable, is great, and wants to come back to this studio versus go on to another one. So that’s a big, big part of it, and we spend a lot of time on just that alone, understanding what the artist wants. Do you think students really need to be passionate about audio engineering, or music, or sound in general when they’re walking in the door? Do you have any tips on how students can train their ears? What can a new student do to impress you? Trevion Belton who recently got hired by you? What skills or qualities do you look for in potential students? Recording Connection grad Goes to NAMM, Gets Going in Audio!